“The pink ribbon is well-known for representing the fight against breast cancer, but many stage 4 breast cancer patients feel that pink does not encapsulate their experience. Metastatic breast cancer may start in the breast, but its spread to vital organs makes the disease fatal. 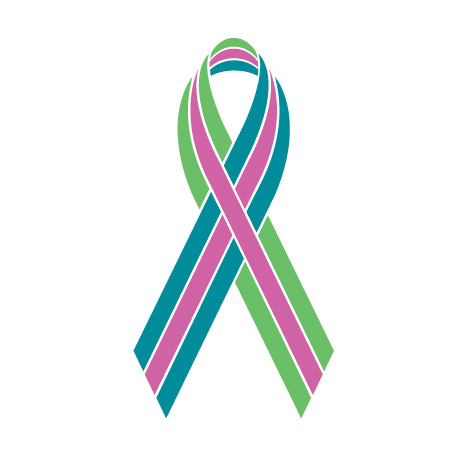 To highlight the uniqueness of the disease and show its commonality with other stage 4 cancers, METAvivor designed a base ribbon of green and teal to represent metastasis. Green represents the triumph of spring over winter, life over death, and symbolizes renewal, hope, and immortality while teal symbolizes healing and spirituality. The thin pink ribbon overlay signifies that the metastatic cancer originated in the breast.” – METAvivor’s explanation of the metastatic ribbon. In 2016 Casting for Recovery held its inaugural program exclusively for women with Stage IV (metastatic) breast cancer. The retreat weekend was a success with post-retreat results proving that women coping with advanced stage disease have specific and often different needs than women with less-advanced stages. Metastatic participants who attend a CfR retreat will have the opportunity to learn an exciting new skill – fly fishing – as well as learn ways to balance a fulfilling lifestyle with ongoing cancer treatment and side effects. Oncologists, psychosocial facilitators, and experienced fly fishers will support these women for a weekend of hope and healing. Last year, Casting for Recovery hosted three metastatic retreats and we’re pumped to announce that in 2018 we have added another metastatic retreat to the schedule. Stage IV breast cancer retreats will be held in the following states: Colorado, Texas, Indiana and Georgia. Women with metastatic BC living in CO, TX and IN may apply to attend the metastatic retreat in their state; women with metastatic BC living in AL, GA, NC, SC, or TN may apply to the GA retreat. Note: Women living in these states who previously attended a CfR retreat may apply again to attend their local metastatic retreat. For specific CfR metastatic retreats dates and locations, please click here. Want to learn more about metastatic breast cancer? Head over to METAvivor, a site dedicated solely to the fight of those living with stage 4 metastatic breast cancer. This nonprofit is run entirely by volunteers, most of whom are living with metastatic breast cancer themselves.